This morning, Sophia phoned the Parrot Foundation. It seems that I am still a bit shy and cautious, but I have started to readjust already. I am quiet now and have been eating a little. 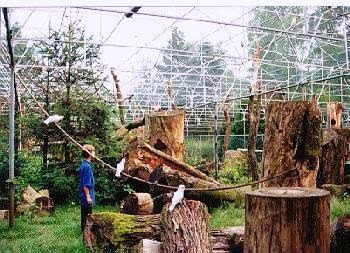 After the quarantine period, I will move to the largest aviary in the world (see picture below). From then on, I will have so many new things to experience and friends to make, that I won't be able keep up my diary. I wish to thank all my real life friends and Internet fans for their love and support these three years. I am sure Sophia will continue to run this site and make people aware of what it means to live with a parrot, but this will be the last entry of my own diary as seen through the eyes of an African Grey Parrot. Thanks again, everyone! Come and visit me if you can, you are always welcome at the Foundation Dutch Parrot Refuge. I am sure you will like it here, whether you belong to the Psittaciformes or Homo Sapiens!